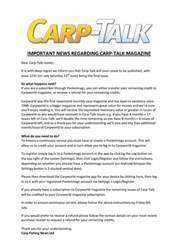 This week’s bumper issue of Carp-Talk (issue 1015) is available to download now! 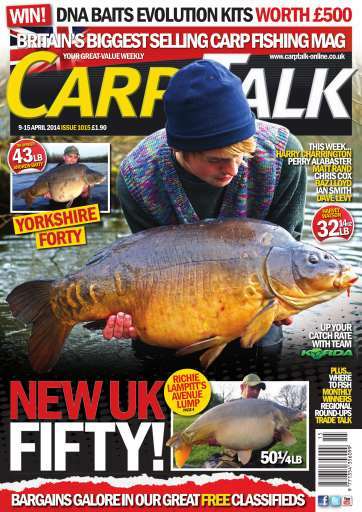 A new UK fifty from RH Fisheries leads the catches this week, closely followed by forties from the likes of Manor Farm Lake, Acton Burnell Top Lake, Willows, Grenville’s, Whitehouse Fishery, Welly and Rookley Country Park Lake. 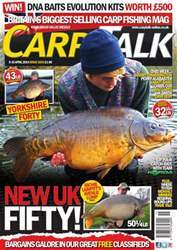 Elsewhere in the mag, Harry Charrington shares some of his spring secrets, Perry Alabaster presents part one of his ‘Positive Approach’ series, Baz Lloyd remembers a memorable year, and Dave Levy talks about the effectiveness of pop-ups in spring. 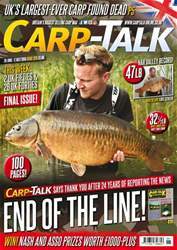 Matt Rand discloses the methods behind his short-session success, Chris Cox details his resetting rig, Ian Smith plans for the year ahead, five more fisheries go under the spotlight in ‘Where to Fish’, and products from Taska, CC Moore, ESP and 30Plus are reviewed in ‘Trade Talk’. 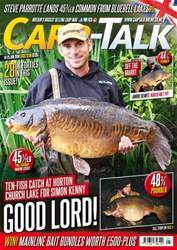 The 2014/15 Fox Mainline Carp Angler of the Year competition continues, we’ve got the latest monthly CC Moore winners and £500 worth of DNA Baits EVO hookbaits is up for grabs.